If you’ve been following the market pretty closely, you have no doubt seen the strong outperformance in small caps to kick off 2019. From a longer-term perspective, though, it’s pretty amazing to see that small caps have pretty much been trading range-bound with respect to large caps over the last ten years. 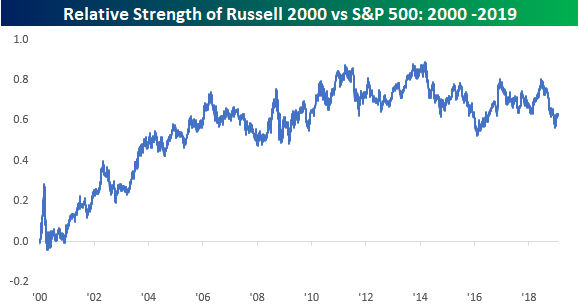 The chart below shows the relative strength of the Russell 2000 versus the S&P 500 since the start of 2000. In the chart, a rising line indicates small cap outperformance relative to large-cap, while a falling line indicates that large caps are outperforming. While small caps saw steady outperformance from the start of 2000 right up until early 2006, since then it has been a series of shorter-term ebbs and flows where phases of outperformance by either large or small caps are measured in months rather than years and neither one takes a big lead over the other. 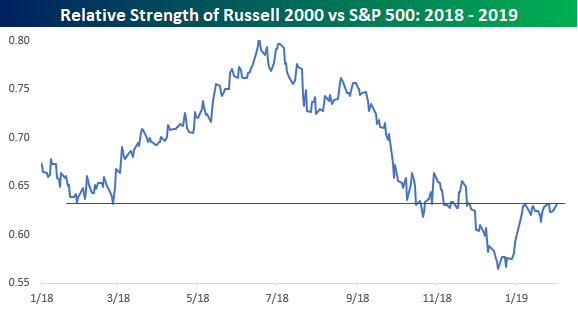 To illustrate, since late January 2006, the Russell 2000 is up 114%, while the S&P 500 is up a nearly identical 115%. Looking at the more recent dynamics between small and large cap stocks, after finally starting to make up some ground versus large caps, small caps have approached a key potential resistance level that had previously acted as support. If the index’s relative strength manages to break above this level, it would set the stage for an even more meaningful rally and quite possibly lead to 2019 being a big year for small caps.